The Queen Mary – What a Marvelous Maiden!! It was an absolute pleasure not only to see the Queen Mary on our recent trip to Long Beach, California, but to go aboard was like a dream sequence. The picture above was taken at approximately 6:00 p.m.; I couldn’t wait to walk those halls! Oh, I must say that the photos are much better when you click on them to enlarge the detail! This incredible passenger ocean liner was built in Clydebank, Scotland in the 1930’s. Her maiden voyage as a luxury vessel was in 1936 from Southampton, UK, to New York. The Queen Mary was known for her speed as well as her beauty. Dignitaries, royalty, and the Hollywood set took great pleasure in adorning the ship’s cabins and decks. When WWII and its bleak days blanketed the world, the Queen Mary was retrofitted as a troopship, carrying approximately 15,000 soldiers into the depths of war. After WWII, the magnificent vessel was retrofitted once again to provide luxury travel for her adoring upper-crust crowd. However, in the 1960’s, travelers began to turn the tide, as it were, and focus on air travel for their worldly adventures. 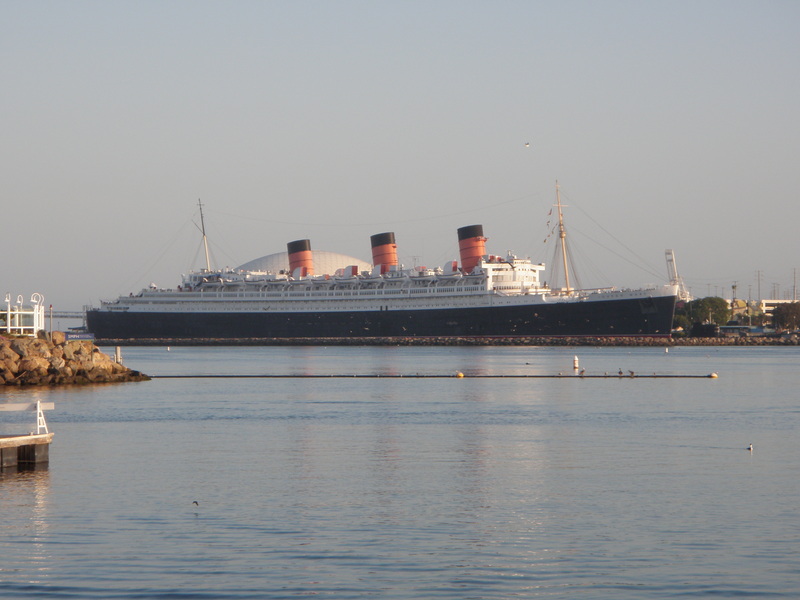 In 1967, the Queen Mary made her last voyage and settled into Long Beach life as a fascinating landmark. The ship is still equipped with staterooms and restaurants, providing a floating hotel of remarkable and historical significance. Now that I’ve bent your ear a bit regarding the history of my new-found friend, I’ll turn to our own experiences aboard the “Grey Ghost”, as she was called during WWII. 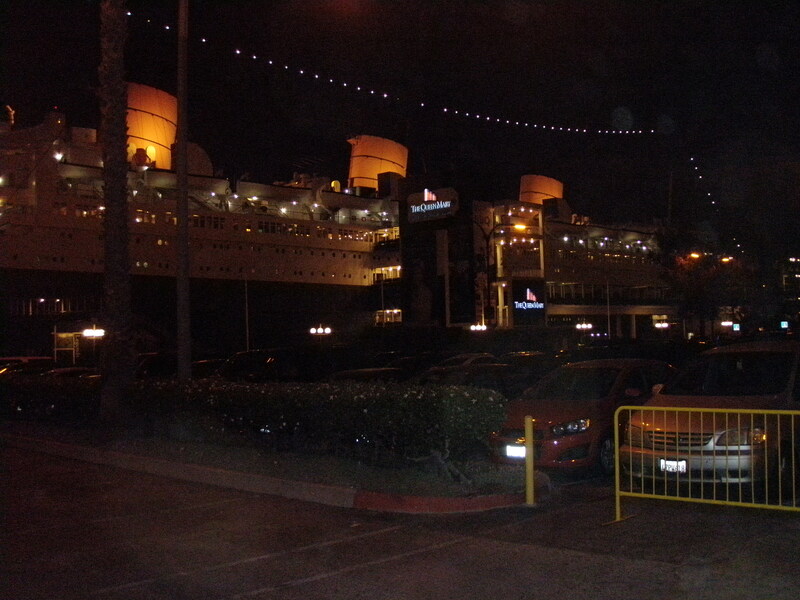 As we approached the Queen Mary, I could feel the excitement building. Knowing a tiny bit about its history made the visit all the more thrilling! What tales she would have to tell! I took the above photo at approximately 8:00 p.m. I apologize for being unable to get the entire ship in view! She’s too grand for that! Security is very tight on the Queen Mary. I like that, as it is such a massive vessel that one could get lost if left to one’s own devices. The idea of being a stowaway wouldn’t get you too far though since she’s not moved in over 45 years! The fact that the Queen Mary is stunning was a bonus beyond words. So much of the ship has been preserved and/or maintained that you could swear it was 1938 or thereabouts. As we walked along the various decks, I could not help but feel the grandeur and wondered aloud if this is what it felt like to be a passenger all those decades ago. 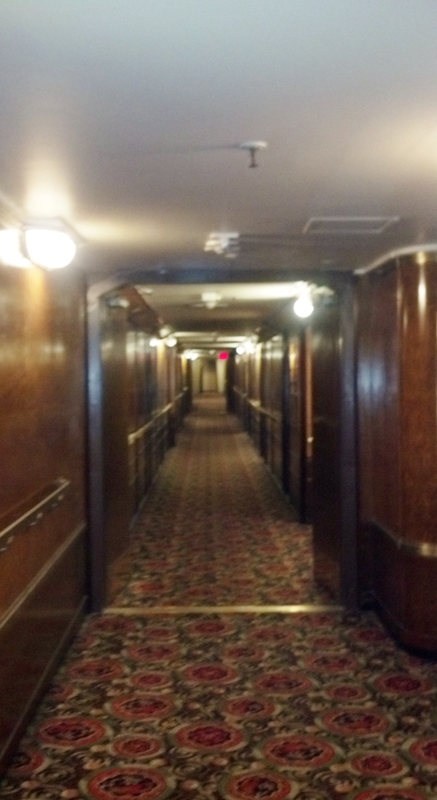 The next photo was taken in a hallway approaching one of the numerous restaurants on board. Note the slatted, wooden floor! This photo was taken on one of the decks where the cabins are located. There are numerous decks and I seem to recall each having its own reception area! How posh indeed! 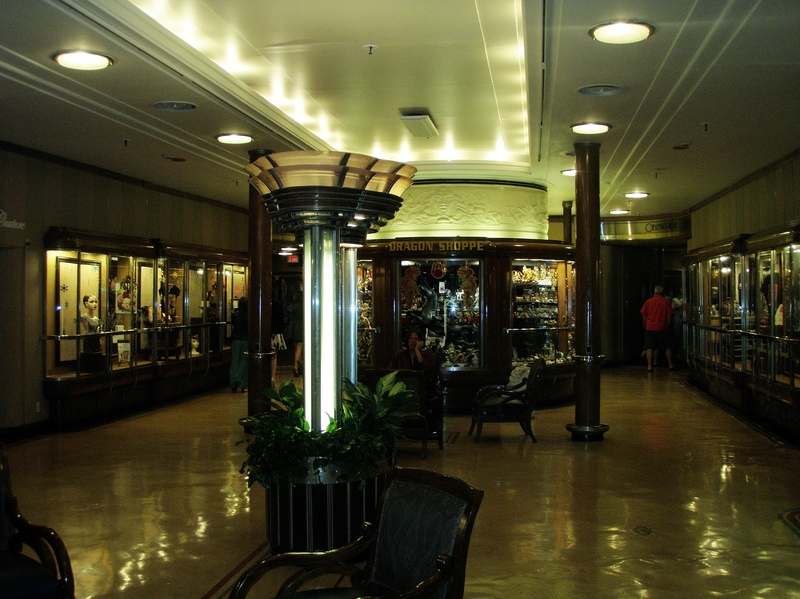 This photo was taken of a shop that was unfortunately closed when we were visiting the Queen Mary. 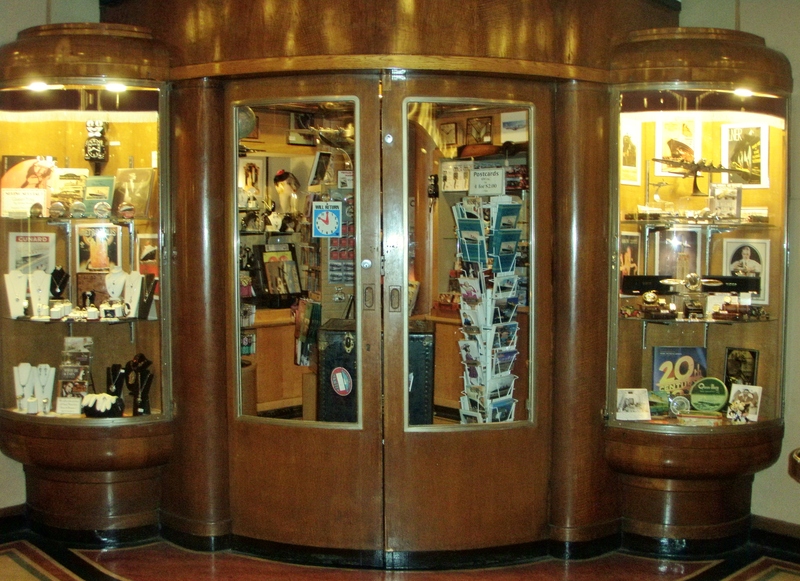 The windows are laden with artifacts from the Queen Mary during her heyday. Can you see the unbelievable woodwork? It was breathtaking. This next picture was also taken in an area with shops and windows with displays of Queen Mary memorabilia. 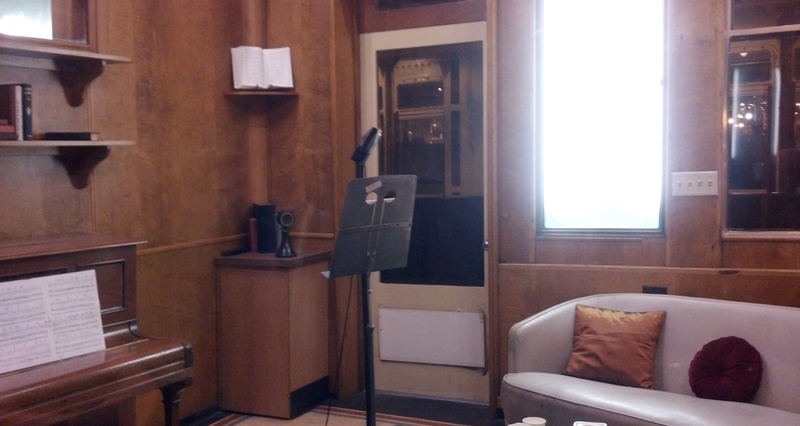 This photo is of a room we were not able to get into; however, it seems to be a lovely display of old artifacts containing a piano, a telephone, and a microphone with a stand. I am wondering if this is used in some way to broadcast radio programs. I attempted to find out more, but could not seem to obtain anything concrete. If I do, I’ll be certain to let you know! This room was the First class Music and Rehearsal Room. 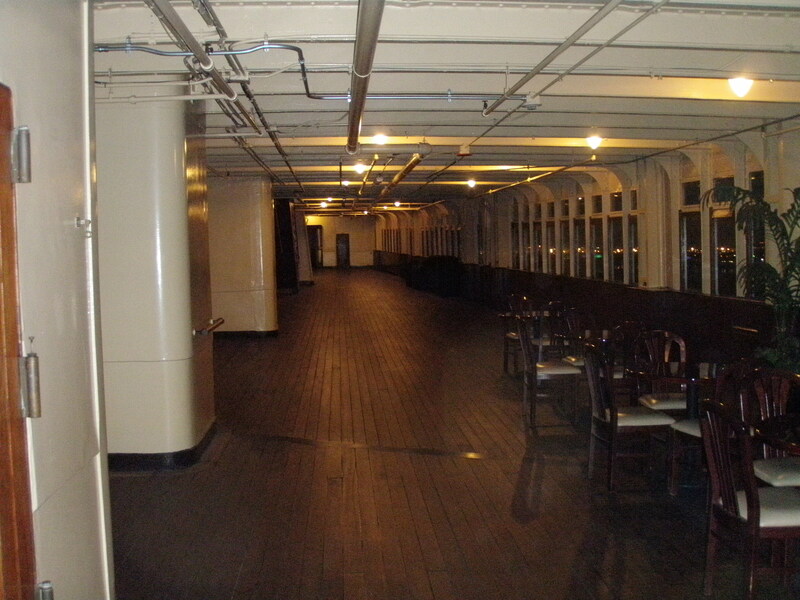 The room was used by the Queen Mary’s first class passengers to rehearse music, speeches, or presentations. Many of the famous passengers (Bob Hope and Liberace to name two) did utilize this room, and they also performed as on-board entertainment for other passengers. Jennifer also noted that despite the fact the furnishings in the room are original to the Queen Mary, they were not originally located in the room. On another deck was a baby grand piano; this piano was the original piano that was used in this room. Because of how small the room is and how large the piano is, there was no room for any other furniture. Thank you again, Jennifer for clarifying this information! I could most certainly write a volume’s worth of information about the Queen Mary and its fascinating past. I shall leave it at that for now, and hopefully tantalizing you with the next “LA/Long Beach” post! We’ll take a little journey to Hollywood, where the stars shine not only on stage, but on the illustrious “Walk of Fame”! Do stay tuned, please!